Nagoya Railroad Co Ltd. (a.k.a. Meitetsu) class 7500 EMU. This train consists of 6 permanently coupled motorized cars. The driver's stand is placed in a cabin on top of the train, which gives the passengers in the front car a good view forward. Realistic driver's stand with speedometer, manometers (pressure gauges) and pilot lamp. 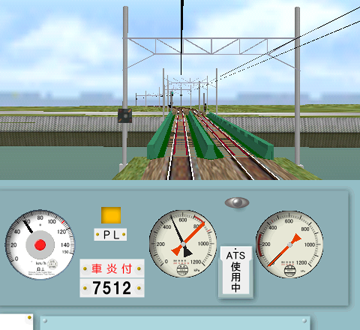 In the OpenBVE simulation this train is equipped with a constant speed holding device. In real life this feature is abolished for this train class. This train is since >10 years ago gone from the Internet.